The Boston Girl: A Novel (Paperback) | Eagle Harbor Book Co.
Anita Diamant (The Red Tent) tells the story of a plucky young woman of immigrant parents who makes her way amidst the teeming multicultural North End of Boston in the early twentieth century. She becomes an astonishing role model for her granddaughter who asks her "How did you become the woman you are?" A wonderfully heartwarming and inspiring novel! An unforgettable novel about a young Jewish woman growing up in Boston in the early twentieth century, told “with humor and optimism…through the eyes of an irresistible heroine” (People)—from the acclaimed author of The Red Tent. Anita Diamant’s “vivid, affectionate portrait of American womanhood” (Los Angeles Times), follows the life of one woman, Addie Baum, through a period of dramatic change. Addie is The Boston Girl, the spirited daughter of an immigrant Jewish family, born in 1900 to parents who were unprepared for America and its effect on their three daughters. Growing up in the North End of Boston, then a teeming multicultural neighborhood, Addie’s intelligence and curiosity take her to a world her parents can’t imagine—a world of short skirts, movies, celebrity culture, and new opportunities for women. Addie wants to finish high school and dreams of going to college. She wants a career and to find true love. From the one-room tenement apartment she shared with her parents and two sisters, to the library group for girls she joins at a neighborhood settlement house, to her first, disastrous love affair, to finding the love of her life, eighty-five-year-old Addie recounts her adventures with humor and compassion for the naïve girl she once was. 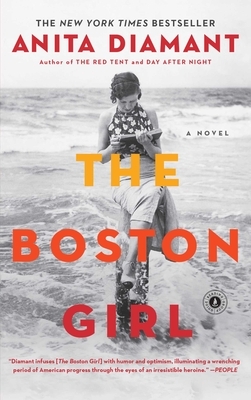 Written with the same attention to historical detail and emotional resonance that made Diamant’s previous novels bestsellers, The Boston Girl is a moving portrait of one woman’s complicated life in twentieth century America, and a fascinating look at a generation of women finding their places in a changing world. “Diamant brings to life a piece of feminism’s forgotten history” (Good Housekeeping) in this “inspirational…page-turning portrait of immigrant life in the early twentieth century” (Booklist). "Addie is…a good storyteller, and her descriptions of the human devastation of World War I and the flu epidemic … have an immediacy that blows away any historical dust." "A beautiful novel that captures yourheart."